The attack on Alexandria did not end with sunshine and lollipops for Rick. He lost the first woman he'd had real interest in since his wife died, chopped off her hand to save his son, who also got shot in the face. Ouch. 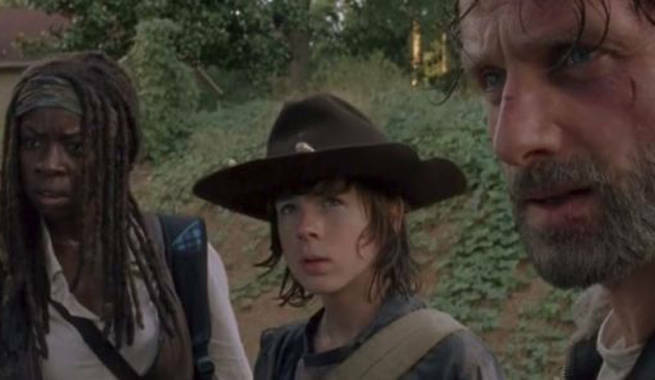 This is around the time that Rick turned things around (well, for awhile, until that whole Negan situation grows into a problem), seeking to fix Alexandria and help Carl live with his new affliction (the whole only having one eye thing). He struck up a relationship at the time with Andrea, one he's still in today - but there's a problem with the TV show following the comic book in that regard. Andrea's been dead for a few seasons now. The popular theory is that Michonne and Rick might get together next, fueled by a comment from showrunner Scott Gimple to THR. Rick and Michonne have had some good chemistry on screen, but nothing that's made us specifically think there's romance in the air. We'll find out more when The Walking Dead airs Sunday at 9pm on AMC.